This category is annually the most challenging. This year it was particularly difficult to narrow down a lengthy list of very worthy candidates in each class to just one nominee. Don’t be surprised if we come back in a week or so and expand on players that deserve a mention in this category. We’ve been well aware of the potential of 6’9 Kai Jones since the spring of 2017 just after he arrived from the Bahamas. Maybe too much was expected from him this past season at Orlando Christian Prep as he wasn’t much more than a spot contributor off the bench for the Class 3A state champs. Part of that was due to his being unfamiliar with a faster, more physical game than what Jones was used to. At times, Jones looked lost. That wasn’t the case this spring and summer as Jones was often the lone “big” playing on a Team Breakdown with a bevy of talented guards. In the spring, he caught attention for his quickness off the floor for blocks and rebounds and his speed up the court in transition. His improvement was well-noted. However, after a chance to get more familiar with this teammates during May and June, Jones became more comfortable on the court and his play (along with his recruiting stock) rose rapidly. He’ll take and make jumpers from the free throw and short corner areas of the court with consistency, score thru contact in the post (belying his slim frame) and has the ability to grab a defensive rebound, bust out of the pack, and get the ball up the floor in transition. He was instrumental in leading Team Breakdown to wins in the Orlando Summer Hoops Festival. After the events in Las Vegas were over to conclude the final “live” period for July, NBADraft.com named Jones one of the Top Ten Big Men to Watch in the prep ranks next season. He will attend Brewster Academy in New Hampshire. It’s quite possible we could look back at the Orlando Christian Prep frontcourt of 2017-2018 and find that they fielded three future NBA players in Nassir Little, C.J.Walker, and Kai Jones. Coaches are always looking for players that are (or can become) matchup problems. The need to play both inside and out, as well as recognize your advantage over an opponent and make the most of it, make the eyes of recruiters “pop”. That is pretty much what 6’6 Corey Walker out of Jacksonville did this spring and summer while playing for Game Elite Gold Florida on the Adidas Gauntlet circuit. With a solid mix of size, strength, and athleticism, Walker has the ability to overpower small guys inside or when taking the ball to the basket from the perimeter. If a bigger opponent is the defender, Walker’s speed and quickness are used to his advantage. Defensively he has greatly improved and is now effective at switching out in ball-screen situations against smaller defenders. A few national recruiting sites feel that Walker is a top thirty player in the Class of 2020. That’s a lot to live up to with two more years of high school hoops to go. However, should Walker continue to improve his overall game like he has the past six months, then he should easily make that mark. There was an article in the esteemed publication Basketball Times in the May issue about what college coaches feel that young high school players (freshmen and sophomores) should be working on to get noticed by recruiters. The one skill that kept coming up was perimeter shooting. If that’s the case, 6’1 A.J. Neal of Showtime Ballers is well-ahead of the curve. 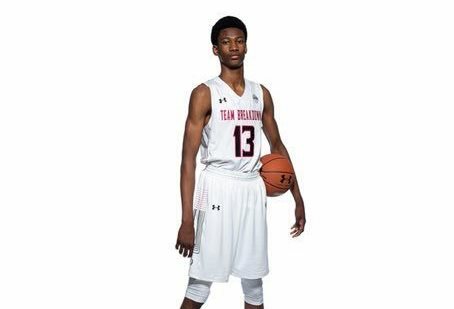 In a four game stretch at the Under Armor Invitational during the first live period in July, Neal scorched the nets from deep, going 20-36 (55.5%). In consecutive games, he was a combined 12-17 from beyond the arc. Neal’s release is quick and he always appears shot-ready. He also has improved his ability to score off of a dribble or two after getting by a defender attempting to close out. As the July “live” period advanced, so did the notice of Neal’s game.